Antihelmintic drug against canine and feline nematodosis. 10 ml polymeric bottle with a syringe dispenser. Outer package - carton. Unlike any of the other antihelmintic drugs, Dironet Junior does not reduce animal immunity. Ultimate decrease (to 5-7 days) in waiting period between deworming and immunization. Promotion of affected intestinal tissue regeneration by killing worms. Antihelmintic action is located only in intestine, so the drug is indicated for animals with hepatic and renal diseases. 1 ml of Dironet Junior contains pyrantel pamoate - 15 mg and sodium ribonucleate - 0.5 mg (as active ingredients), as well as excipients. Mechanism of pyrantel pamoate action involves block of neuromuscular impulse transmission, damage of cellular membrane permeability and cholinesterase inhibition causing paralysis and death of a parasite. Sodium ribonucleate accelerates regeneration of intestinal cells injured by roundworms and stimulates organism immune activity. Dironet Junior has positive effect on animal immunity providing ultimate decrease (to 5-7 days) in waiting period between deworming and immunization. For treatment and prevention against canine and feline nematodosis (toxocarosis, toxascaridosis, uncinariosis, ankylostomosis, trichocephaliasis). Do not use Dironet Junior in puppies and kittens under 3 weeks old. Do not use Dironet Junior with piperazine and levamisole preparations due to potential increase in toxicity. 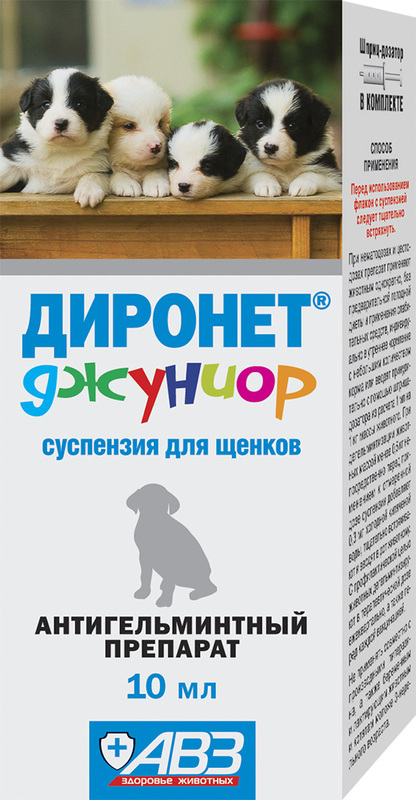 Use Dironet Junior in puppies and kittens, as well as in adult animals by individual oral administration in a single dose during a morning feeding or forced administration with a syringe dispenser (1 ml of suspension per 1 kg of body weight). Deworming of animals weighting less than 0.5 kg: add 0.3 ml of boiled water to weighted dose of the drug immediately before oral administration, carefully shake and give it to animal. Treatment: according to indications. Prevention: quarterly, in dose listed above. Store Dironet Junior in closed original package. Protect from light and moisture. Store separately from food and animal feeding at 0-25°С. Keep out of the reach of children and animals.